Filmmaker Ross Kauffman has worked in the film industry for more than two decades. His directing credits include the Academy Award-winning Born Into Brothels and, more recently, E-Team (along with Katy Chevigny), which was acquired at Sundance 2014 by Netflix and is currently streaming there. 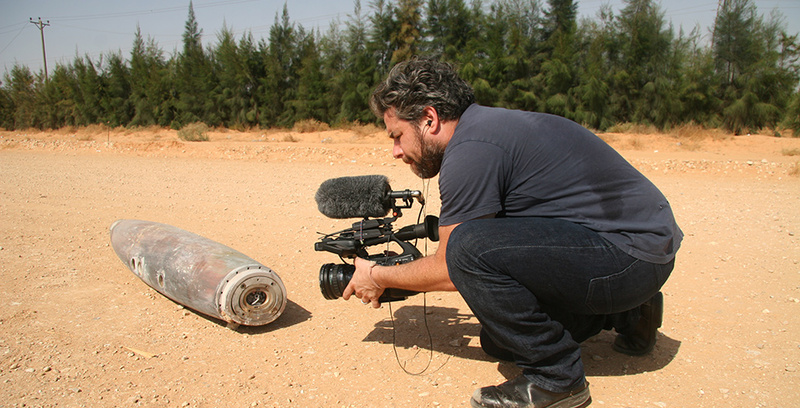 He is also a top documentary cinematographer, and his work has taken him to such war-torn areas as Syria, Libya and Kashmir. As part of IDA's GETTING REAL conference, Kauffman participated in sessions that focused on the documentary career and on ethics. We caught up with him by phone and email for a conversation about these issues. What follows is an excerpt from that conversation. You participated in a session that addressed the documentary career. What were your thoughts about the documentary career going into the conference, and then coming out of it? When we talk about career, most of the time we're talking about the business of the career, the amount of money we make, the amount of business we generate, the kind of films we make. But what I came out of the conference with was a renewed sense of community. And sometimes we forget that that's a huge part of any career: the community of which we are a part . So for me, I'm always fascinated to hear other people's stories about what they do, how they do it and how they go about finding their way. I've found that the documentary community all around the country—and the world, really—is very supportive. To be able to convene with so many richly talented people from all different backgrounds without the distraction of a film festival was very refreshing, and it reminded me that this is an encouraging and generous community. In terms of the economics of the career, the panel with Esther Robertson moderating and [journalist] Adam Davidson speaking from an economist's point of view was eye-opening to many people who aren't actively engaged with people from other disciplines in life—particularly people from the financial world. Adam challenged us to really think about the economic model of creating documentaries and think about how we engage with that model—how we either accept it for what it is, or how we can try to change it, or how we can at least look at it from a different perspective. One of the enlightening aspects about this conference was that it gave us all a chance to try to see things from a different point of view. Bringing us all together and asking some of the hard questions forces us to look at things from a perspective that might not be comfortable, but needs to faced head-on. What changed your mind about what was explored about the community, or any specific aspect of it? In the session that I participated in about the documentary career, Joe Berlinger mentioned that for a long time he didn't really engage that much with the community; he was doing his own thing. And then when the issues came out about Crude and his difficulties with Chevron [Chevron subpoenaed Berlinger for footage from Crude. ], the community rallied behind him. He seemed to come away with a sense of, "Wow, this is a pretty incredible community!" He seemed to discover something in that. So, listening to Joe and other people talk about how their sense of this community has changed for them was invigorating. In the wake of the conference, what do you feel are some of the major issues or challenges of most concern to the community? I sat in on Joe's session about the Crude case. I think that's a huge issue for us to confront and try to rectify. If we can have our footage taken away, then we aren't protected by the standards of journalism. The economics of this business is always an issue. It was before the conference, and it will be after the conference. I think there were topics addressed in a different way that will encourage us to go forward and think about things and maybe try to do things a little bit differently. The subject of social impact brought up many questions for me: What exactly is social impact? How do we measure social impact? Should most documentaries have social impact? What is the responsibility of the filmmaker to insure that there's as much social impact as possible? Are we filmmakers or are we activists? To what extent does this idea of social impact affect not only how we make films, but the films we choose make? A film that will have, or at least is portrayed to possibly have, social impact—is that the way we should be measuring if a film is worthy enough to get financed? These are important questions. That seemed to be one of the salient takeaways. I have a film called Wait for Me that I've been working on for years. It's about a mother whose son went missing in the mountains of Kashmir 30 years ago, and she believes he is still alive. At one point when weren't having any luck with funding, my producer and I thought, "Oh, you know, maybe we should create some kind of social impact angle and target missing person foundations and tap into the social impact of missing people around the world." Well, that conversation lasted about 20 seconds. We thought, "What the hell are we doing? This is ridiculous." It's definitely hard to get films funded that don't fit into the social impact model. But films like Wait for Me—about humanity as opposed to a "social issue"—are also important. I think about films like Marwencol or Grey Gardens—films about the human experience. Are they worth making? Of course they are. And as for impact, they have an incredible impact with people; it's just a different kind of impact. It's an emotional impact, which might even be stronger than the social impact most films that are easier to fund try to achieve. It might be interesting to measure "emotional impact" versus "social impact." Maybe emotional impact affects the world more positively than social impact? I wouldn't know how to quantify emotion, though. It would be fascinating to do a study and try to quantify emotional impact. If you could quantify emotion, we might find out that when we as filmmakers emotionally move people, they may be apt to do so much more in different ways. They might actually be doing more in terms of being better people and helping society as a whole. When I see a great movie, I feel like I've changed. I feel like I've grown and come to understand the world and our place in it just a little bit better. We need more funds available to films like these that aren't necessarily motivated by and /or funded because of the possibility of "social impact." Take Grey Gardens, for example. Would that film get funded these days? I'm not so sure. But it's become a seminal work that will live on for generations. Or you can turn it into a musical—which is another response, actually. Ditto for Hands on a Hard Body; I first experienced that film through This American Life. I found it riveting as radio theater, although I never saw the musical. But that affirms that these are works of art and what we're doing as a community is making art in addition to making an impact. Sometimes the impulses are intertwined, but sometimes that's not so apparent. We are making impact and we are artists, and we have to keep both on the front burner. Personally, I'm glad that was a debate and I'm glad that is out there beyond GETTING REAL; if it divides into two camps, well, art forms do that. I also think the term "art" is a little bit of a loaded term. For me, I hear the word "art" and I take a step back. I don't know why; maybe it's because I grew up in a family without any artists. Maybe it's because I've been around a few artists in my time who were a bit on the pretentious side. I just don't look at myself as an artist or a person who makes art. That's why I'm trying to figure out a better term than "art films"—maybe something like, "films about the human experience." With that said, I like the idea of trying to compare emotional impact verses social impact and trying to quantify the former, which actually might create more of an overall positive change. I want to bring ethics into the conversation. You participated in the "Doing The Right Thing" session, in which you shared the ethical quandaries you faced, and how you resolved and emerged from them. What did you learn or find most surprising from your colleagues onstage, and in subsequent conversations, about ethical challenges? Well, people like Pam Yates and Gordon Quinn not only have an incredibly strong moral compass, but they're creative about it. They find creative ways to do what's right. That was fascinating to me. It's a matter of taking the right steps; doing the right thing is often doing something more. It's not just making a decision in the moment; sometimes it's reacting to something that has happened, and putting more effort and energy into trying to rectify or help the situation. It was great to hear people talk about that idea and it helped solidify that thought for me. I've done a lot of different things with [my 2004 film] Born Into Brothels, including selling photos by the kids for a year and a half, raising over $250,000 that went directly to their education, and building a school for girls in the south of Calcutta. It's one thing to do something proactively, but it's another thing where an issue or a problem comes up because of the film you've made and you take it upon yourself to creatively figure out the best way forward. I look up to people like Gordon and Pam, who are so incredibly diligent in their pursuit of doing the right thing. I think the idea of a conference like this—having these kinds of panels where people actually do put themselves out on a limb by speaking truthfully and honestly—is so important. We all learn from that, no matter how long you've been in this business. And that was a huge component to making this conference different from a lot of other gatherings of the documentary film community. The experience left me feeling more hopeful, more informed, with a renewed energy and strength to go forward in this difficult business. It's not an easy road to travel, but the conference definitely was of great value. What Did We Get from GETTING REAL?